AMF and Concern Universal, Malawi (CU) have accepted the Malawi National Malaria Control Programme’s (NMCP) invitation to assume responsibility for the district-wide net distribution re-coverage campaigns in Ntcheu, Balaka, Dedza and Dowa districts in 2018. These are the four districts in which the AMF/CU partnership has distributed nets in 2012, 2014 and will in all districts in 2015. This timing is consistent with the three year re-coverage cycle needed to keep affected populations protected from malaria-carrying mosquitoes when they sleep at night. The planning horizon for NMCPs, so they can secure funds to protect populations at risk, is three to four years. Hence, these future distributions being considered now. This timeframe allows AMF to plan and secure funding in good time. Having specific projects to present to potential donors can help secure funds. It allows Concern Universal to better plan and manage staff knowing the projects they will be working on several years ahead. Staff can be engaged on a permanent, multi-year basis, rather than on a project basis and the team can develop specific experience to manage and deliver all aspects of a distribution with increasing efficiency. The combination of a portfolio of four districts, with each having seven interventions across a three year period (a pre-distribution registration survey, a distribution and five six-monthly post-distribution check-ups), and the staggered timing of the distributions and other interventions, allows an efficient and cost-effective deployment of staff and other resources. Currently, CU’s malaria control activities are focused on carrying out universal coverage net distributions and their follow-up, and monitoring malaria case rate data. The continuity of involvement in these districts will allow CU to deepen collaboration with District Health Officers (DHOs) and their teams and assist in other areas of malaria control, for example with systems and capacity building. Working closely with health centre management teams may lead to improvements in malaria diagnosis and the accuracy of malaria data collected. AMF and CU’s ultimate aim is for our support for malaria control not to be needed. This will be the case if malaria is reduced to a very low level and/or if a population at risk from malaria is able to buy the nets they need and free-to-recipient distributions are not required. Currently, neither are the case. 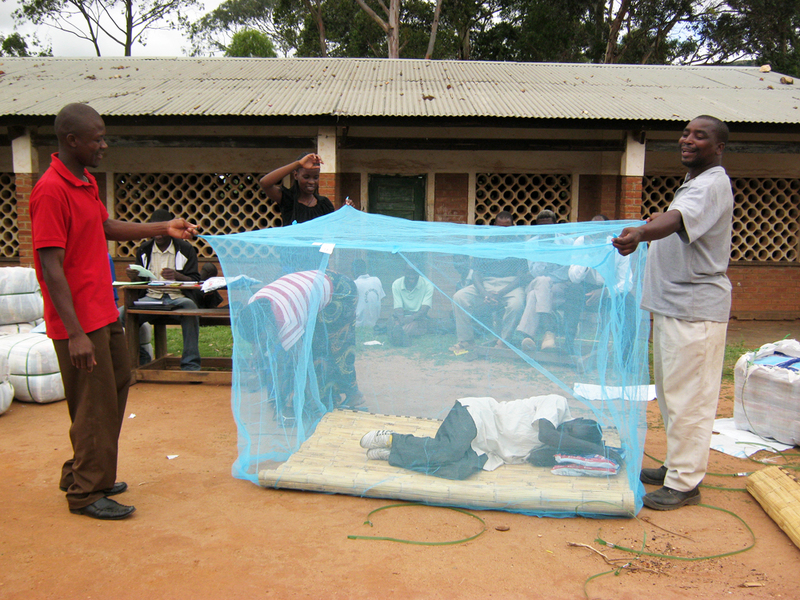 Carrying out three or four cycles of mass distribution of nets, if done well, can play a major role in bringing down the level of malaria in a population so that either or both of these objectives can be met.